Research conducted and funded by the Eunice Kennedy Shriver National Institute of Child Health and Human Development (NICHD) has helped save lives, improve wellbeing, and reduce societal costs associated with illness and disability. The following sections provide examples of groundbreaking scientific findings made possible by NICHD. The NICHD-developed technology that made the Hib vaccine possible was also used to create FDA-approved vaccines against Streptococcus pneumoniae, which causes invasive pneumococcal disease (pneumonia, bacteremia [blood infection], or meningitis) in young children and the elderly. 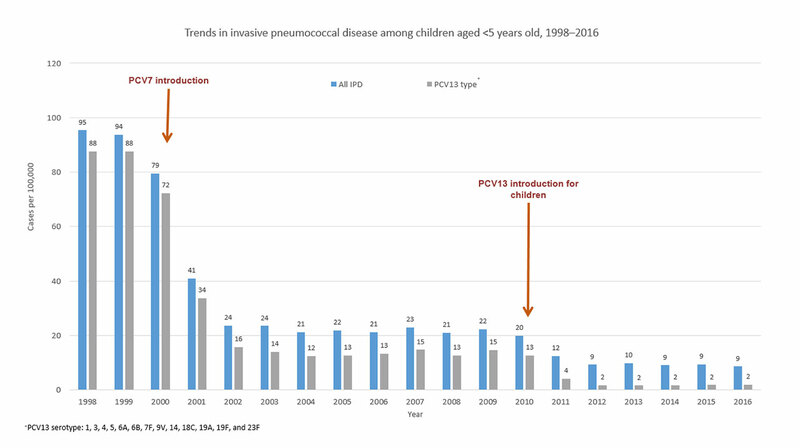 According to the Centers for Disease Control and Prevention, rates of invasive pneumococcal disease among children younger than 5 years old have dropped by nearly 90 percent since 2000, the year when the first conjugate pneumococcal vaccine was introduced. NICHD research confirmed the safety and effectiveness of a simple blood-spot test to screen for phenylketonuria (PKU), an inherited metabolic disorder that, when untreated, can damage the brain and cause severe intellectual disability. These findings led to New York in 1965 becoming the first state to mandate screening of all newborns for PKU. Other states soon followed, allowing for early detection and immediate initiation of dietary therapy, which dramatically reduces the effects of the disorder. Other efforts by NICHD-supported researchers produced the first blood-spot test to screen for congenital hypothyroidism, another treatable cause of intellectual disability. By 1983, most of the United States mandated screening all newborns for this disorder. Today, by using only a few drops of blood, newborn screening detects a treatable condition in about 1 in 300 babies born each year. NICHD-funded scientists were the first to diagnose abnormalities in children whose mothers drank alcohol during pregnancy. Research in the ensuing decades established the degree of risk posed by drinking alcohol during pregnancy and led to the Surgeon General's warnings now seen on all alcoholic beverage containers. NICHD investigators identified the beta subunit of human chorionic gonadotropin (hCG) as the earliest marker of pregnancy, leading to the development and subsequent commercialization of the first home pregnancy test. The test detected the presence of hCG in urine even before the first missed period, enabling women to determine their pregnancy status in the privacy of their own homes. The $10 test hit the market in 1978 and quickly became one of most ubiquitous healthcare products in the world. NICHD research found that high numbers of women were genetically at risk for folate deficiency, predisposing them to have babies with NTDs, such as spina bifida. Additional NICHD-funded research showed that the right amount of folic acid, starting before conception and continuing throughout pregnancy, prevented most NTDs. These findings led to changes in recommended amounts and timing of folate intake for women. Identifying the genetic cause and mechanism of Fragile X syndrome, the leading cause of inherited intellectual disability. Isolating the gene for Rett syndrome, a disorder in which seemingly healthy infant girls gradually lose their language capabilities, mental functioning, and ability to interact with others. Discovering that non-classical congenital adrenal hyperplasia (CAH) is the most prevalent single-gene disorder in the general population. Later findings identified the broad spectrum of disorders caused by CAH and led to treatments for its variant forms, including the first prenatal treatment that prevents characteristic features of CAH, such as genital abnormalities. Mathews TJ, Macdorman MF, Thoma ME. National Vital Statistics Reports Infant Mortality Statistics From the 2013 Period Linked Birth / Infant Death Data Set. Natl Vital Stat Reports. 2015;64(9). Speer CP, Sweet DG, Halliday HL. Surfactant therapy: past, present and future. Early Hum Dev. 2013 Jun;89 Suppl 1:S22-4. doi: 10.1016/S0378-3782(13)70008-2. Meis PJ, Klebanoff M, Thom E, Dombrowski MP, Sibai B, Moawad AH, Spong CY, Hauth JC, Miodovnik M, Varner MW, Leveno KJ, Caritis SN, Iams JD, Wapner RJ, Conway D, O'Sullivan MJ, Carpenter M, Mercer B, Ramin SM, Thorp JM, Peaceman AM, Gabbe S; National Institute of Child Health and Human Development Maternal-Fetal Medicine Units Network. Prevention of recurrent preterm delivery by 17 alpha-hydroxyprogesterone caproate. N Engl J Med. 2003 Jun 12;348(24):2379-85. Rouse DJ, Hirtz DG, Thom E, Varner MW, Spong CY, Mercer BM, Iams JD, Wapner RJ, Sorokin Y, Alexander JM, Harper M, Thorp JM Jr, Ramin SM, Malone FD, Carpenter M, Miodovnik M, Moawad A, O'Sullivan MJ, Peaceman AM, Hankins GD, Langer O, Caritis SN, Roberts JM; Eunice Kennedy Shriver NICHD Maternal-Fetal Medicine Units Network. A randomized, controlled trial of magnesium sulfate for the prevention of cerebral palsy. N Engl J Med. 2008 Aug 28;359(9):895-905. doi: 10.1056/NEJMoa0801187. Trachtenberg FL, Haas EA, Kinney HC, Stanley C, Krous HF. Risk factor changes for sudden infant death syndrome after initiation of Back-to-Sleep campaign. Pediatrics. 2012 Apr;129(4):630-8. doi: 10.1542/peds.2011-1419. Adzick NS, Thom EA, Spong CY, Brock JW 3rd, Burrows PK, Johnson MP, Howell LJ, Farrell JA, Dabrowiak ME, Sutton LN, Gupta N, Tulipan NB, D'Alton ME, Farmer DL; MOMS Investigators. A randomized trial of prenatal versus postnatal repair of myelomeningocele. N Engl J Med. 2011 Mar 17;364(11):993-1004. Tuomala RE (1), Shapiro DE, Mofenson LM, Bryson Y, Culnane M, Hughes MD, O'Sullivan MJ, Scott G, Stek AM, Wara D, Bulterys M. Antiretroviral therapy during pregnancy and the risk of an adverse outcome. N Engl J Med. 2002 Jun 13;346(24):1863-70.
Cooper ER (1), Charurat M, Mofenson L, Hanson IC, Pitt J, Diaz C, Hayani K, Handelsman E, Smeriglio V, Hoff R, Blattner W; Women and Infants' Transmission Study Group. Combination antiretroviral strategies for the treatment of pregnant HIV-1-infected women and prevention of perinatal HIV-1 transmission. J Acquir Immune Defic Syndr. 2002 Apr 15;29(5):484-94.